Lush Fab Glam Inspired Lifestyle For The Modern Woman: Our Lush Fab Glam Makeover! Our Lush Fab Glam Makeover! Welcome to the new Lush-Fab-Glam.com! We thought that the new year would be the perfect time for our glam makeover, we love the changes and hope you do to! This is just one of the new year resolutions that we mentioned in our Happy New Year message to our readers. So what's changed? For the most part the layout and color scheme of the site has remained the same. We didn't want to change so much that we would be unrecognizable, so we kept the things you love, added a few extras, jazzed up others. And we have made it much easier for you to navigate through the site and find the things you want to read and share. 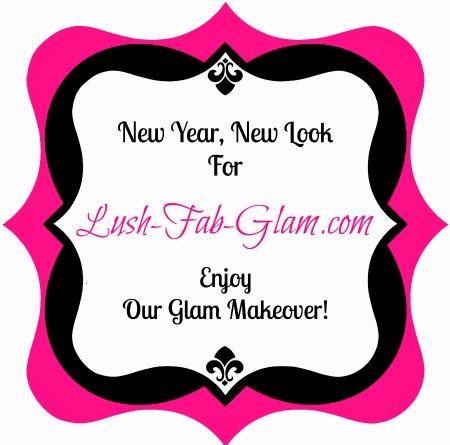 Do you like the new Lush-Fab-Glam.com and which change is your favorite? Share with us by leaving a comment below. pretty pretty pretty love it all! This is by far one of the best blogs I've come across, love the color, posts, pictures just beautiful.